Once upon a time three men and a lady crash-landed in a deep crater in the far off great continent at the bottom of the world called Antarctica, where they found a mysterious land unknown to the rest of the world. Antarctica is very, very, very cold! Before these three people went on their big adventure, they first met up in the capital of the United States of America, Washington, D.C. where an important soldier called Capt. Burnham was telling a lot of other soldiers all about Antarctica. Capt. Burnham told everyone there that Antarctica is "Five million square miles of terra incognita." That just means it is really, really big and pretty much unknown, even these days! The captain told everyone there that their job was to sail to Antarctica and make a lot of maps of the place so it wouldn’t be so unknown anymore. 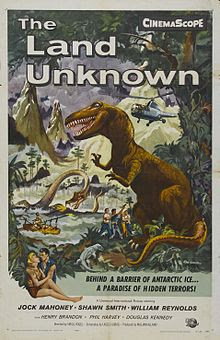 But even more importantly, they were meant to explore a warm area that was surrounded by all that ice. How did the warm area get there? It wasn’t supposed to be there! Suddenly, in came a pretty lady called, Miss Margaret Hathaway, a reporter with Oceanic Press. We’ll call her Maggie. She was a bit naughty for being late but she did the right thing and apologised for arriving late. All the men suddenly stopped looking at Capt. Burnham when Maggie walked in and turned to stare at her as if she were a beautiful princess. I think maybe the silly men had never ever seen a lady before in their lives. Their mummies had certainly never told them that it is rude to stare. Maggie seemed very happy about this when she replied, “I always love to meet men, Captain.” In fact, Maggie must have been really used to men because she told the captain that she once “was alone with half a million of them for three months in Korea.” Imagine that! My, she must have been VERY busy getting to know all those men! So, being alone with only 800 men in Antarctica would be a cinch for Maggie! Maggie soon met some other people who were going on the expedition to the big land of ice and snow. Funnily enough they were all men, which probably explains why they were so shocked to see Maggie when she walked in. First, there was Commander Alan Roberts. For some reason, he was also known as Harold or Hal. He was a geophysicist which means his job was to work out what it was like inside the earth from what was happening on the outside or the surface of the earth. He was a very important man. To make sure they got around quickly in Antarctica and that they could land in difficult places, there was also the whirligig copter pilot, Lt. Jack Carmen. Pretty soon the expedition ships sailed off to Antarctica. But just as they were approaching the coast of the Ross Ice Pack, a humongous lot of ice blocked their way which meant that the expedition would be two weeks behind schedule. Alan, Jack, Maggie and another man, a mechanic called Steve Miller took off from their ship in the whirligig copter. Suddenly an angry looking storm approached which meant they had to return at once. I don’t blame them. I’m terrified of lightning! Are you? At that moment, they caught sight of the warm region of Antarctica that wasn’t supposed to be there. 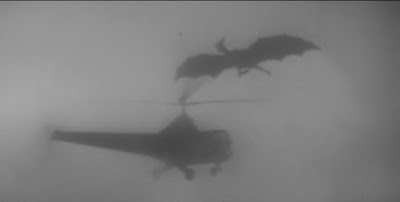 Just as Jack spotted a break in the clouds to get through the passing storm, a pterodactyl or flying dinosaur swooped at the whirligig copter damaging it. Oh No! Down, down they slowly went way below sea level, all the way to 2500 feet as the temperature rapidly climbed to 91 degrees. At last they broke through the clouds and landed in a strange yucky sticky humid place filled with plants and trees and blanketed by a thick fog or mist. Until the whirligig copter could be fixed, this is where they would have to stay. It seemed like it was a spooky and dangerous place with odd plants that had tentacles, bubbling mud springs and pterodactyls. One of the plants almost got poor Maggie but she moved away in time. It turned out that they were trapped in a primitive prehistoric forest. How did the forest get there? Clever Cmdr. Roberts told the others, "It's my guess that this valley is still in the Mesozoic Era." The Mesozoic Era occurred a very, very, VERY long time ago: 252 to 66 million years ago. The dinosaurs are thought to have become extinct about 65 million years ago. Well, the repairs to the whirligig copter weren’t going very well and there was no luck with trying to contact the base using the radio. All they could do was to set up a camp nearby. What would YOU do if you were lost and stuck in a strange place and couldn’t get home? The next day the sound of a search-aircraft’s engines could be heard above the cloud layer. HOORAY! Jack tried using the radio to contact them but, oh my gosh, the signal was too weak to be heard. What a shame! The four grown-ups soon realised just how much danger they were in when they came across two giant lizards fighting. The fight also attracted a T-Rex. That was a dinosaur called Tyrannosaurus Rex. Tyrannosaurus walked on two powerful legs and was a meat eater that measured up to 40 feet in length and weighed up to 10 tons. So, when Jack fired his revolver at Thumper Rex, it had no effect. All the grown-ups could do was to rush into the whirligig copter and fire up the engine. Now, your mommies have probably warned you about NOT putting your fingers near the blades of fans, right? Not so for Mr Thumper Rex! He just kept THUMP -THUMPING and GGRRR - GGRRRING toward the whirligig copter until the spinning blades sliced through his skin - OUCH! - making him awfully mad. As Mr Thumper Rex got ready for another attack, the loud mysterious sound of a horn startled him and caused him to retreat. The grown-ups felt it was safe to leave the whirligig copter and move their food and supplies to the copter’s cabin. What a surprise it must have been when they discovered that many of cans of food had been opened! Who could have done this? Oh, no! That would only mean they were not alone! Later on, Jack, Alan and Steve discovered footprints and a scrap of Maggie’s clothing. It turned out that Maggie had gone off to get some water for a small monkey they had earlier found. When she was returning to the copter, she was surprised by a large lizard. 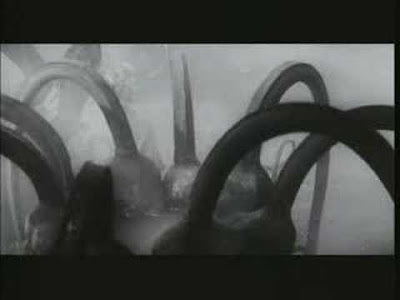 This caused her to drop the poor little monkey which was captured and eaten by the tentacle plant. Just at that point, Maggie was kidnapped by a stranger who put her in a raft and rowed away with her. Maggie’s kidnapper took her down river to his cave shelter. When she woke up he said to her, "The whole valley is mine. Everything in it belongs to me, including you." He sounded like a very bad man. He also lied to Maggie when he told her that the others were dead. However, Maggie soon noticed the three men rowing towards the cave in their raft. Luckily Jack, Alan and Steve managed to rescue Maggie when she screamed just as the stranger began grabbing hold of her against her will. Maggie was very clever to make as much noise and commotion as possible to attract attention to her. It turned out that the man was called Dr. Carl Hunter, that he had been part of the 1945 expedition to Antarctica and that he had survived a plane crash in which three others had been on board. Dr Hunter had been alone for an awfully long time. He even wanted the others to agree to leave Maggie behind in return for the location of the plane’s wreckage and the parts that could be of use. Being so alone in such a dangerous situation for so long must have had a big effect on Hunter who no longer thought and behaved in a civilized way. I guess he also must have liked Maggie very much and would have preferred her company probably as much as those half a million men in Korea would have! As it turned out Jack, Alan and Steve took Maggie back with them and left the cave leaving Dr Hunter all alone again. While Dr. Hunter spent his time smashing dinosaur eggs and blowing his conch shell to make a strange sound to drive dinosaurs away, Alan and Maggie were harassed yet again by bad-tempered Mr Thumper Rex. Now we know where that earlier sound came from. Maggie also managed to fall into the clutches of the tentacle plant. Luckily she was saved by Dr Hunter who was nearby watching her. After doing that, he quickly left. It wasn’t long before Jack, Alan, Steve and Maggie realized that they only had about three days left before winter time and the freezing of Antarctica and the end of any rescue attempts that might be made. TICK-TOCK: Time was running out! While Jack and Steve went off to search for the 1945 expedition wreckage, Maggie managed to slip away from Alan and row off down the river using a raft. Can you work out what she was planning to do and why it was so brave of her to do so? Unknown to Maggie, a huge prehistoric creature was lurking under the water - a Plesiosaurus. That creature was aquatic which means that it lived in the water. Let’s call it “Nessie” after its famous relative in Loch Ness, Scotland. Maggie could not see Nessie slowly but surely approaching her raft. Hunter could see it though! He moved in closer with his raft which had two lit torches attached to the front of it. He also blew his conch horn to frighten Nessie away and warn Maggie of the approaching danger. When Nessie was close enough, Hunter threw a lit spear right into its mouth – good shot! - but Nessie was clever enough to put it out by going under the water. Nessie once again had another lit spear thrown into its mouth. Meanwhile, Hunter with Maggie's raft tied to his raft rowed back to his cave shelter. Steve saw Hunter carry Maggie into the cave and followed him in. Steve and Hunter then had a big fight which Steve won. 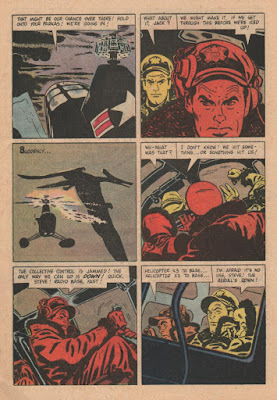 Steve then did a very bad thing: he used fire to get Hunter to tell him where the site of the wreckage was. Sometimes grown-ups can do some very wicked things if they’re desperate enough. This never makes it right though! Jack and Alan arrived at the cave in time to stop Steve’s cruelty from going any further. Hunter then gave Alan a map showing the site of the wreckage. While Jack, Alan and Steve went to find the wreckage, Maggie stayed behind with Hunter and helped to take care of his injuries. At the wreckage site, Jack, Alan and Steve found the graves of the men who had died in the 1945 expedition. They also found an aircraft spare part that would work on their whirligig copter. A bit later Maggie heard the sound of the copter’s engine and decided to return to camp. As she approached the cave shelter’s exit, Nessie appeared and Maggie was knocked down to the cave floor. Luckily, Hunter managed to pick her up and take her outside. Back at camp, Mr Thumper Rex decided it was pay-back time and steadily made his way toward the men and the repaired whirligig copter. Just as he got there, the copter lifted off. Never mind Mr Thumper Rex! The three men then flew a bit further on towards the river where they used a winch to pull Maggie up off Hunter's raft and get her aboard the copter. Just like in those helicopter sea-rescues you sometimes see on the news on TV! Meanwhile, Nessie and Hunter battled it out on the river below. When Nessie caught sight of the flaming torches he ducked under the water and then WHOOSH! resurfaced under Hunter’s raft causing Hunter to fall off into the water. Then KABAM! Nessie smashed Hunter with his flipper. Just in the nick of time, Hunter was saved from certain death by Alan who fired a flare into Nessie’s mouth. By now Nessie’s mouth must have felt like yours would if you had eaten chillies, wasabi or a hot pepperoni pizza. As Nessie sank under the water, brave Alan jumped into the river from the copter and put the harness around Hunter. After both men were aboard, the grownups flew out of the strange land unknown. As they approached the ship, they realized that they were very low on fuel. OH NO! Don’t tell us it was going to end like that! Not after all they had been through! To crash in the ocean so close to the deck of the ship? Yes, they did crash but luckily all five grownups were rescued. Later on, when Alan and Maggie were together on the ship’s deck, Alan told Maggie there might be another expedition the very next year and he asked her if she would like to come along. And guess what Maggie said: "No thanks, I've had it!" Who could blame her! Maggie went on to ask Alan, “Well, who'd stay home with the baby?” Alan didn’t at first get what she meant when he replied, “Sure, who'd stay... What baby?” He finally got it when she said to him, “Ours, silly. Why by this time next year...” As they kissed they knew they would live happily ever after……. 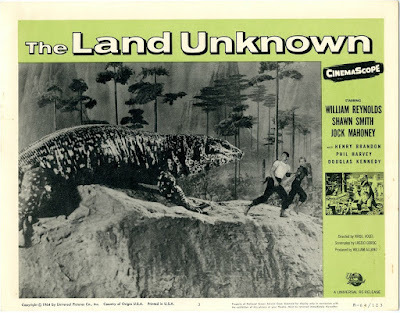 The Land Unknown does have good direction and pacing and has managed to create a convincing fog-shrouded prehistoric landscape, but the low budget special effects are very ordinary. The Tyrannosaurus looks like nothing more than a man wearing a costume. The lizards are just….lizards! 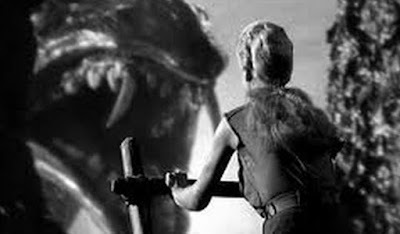 How many times have we seen enlarged lizards battle it out on the screen?! 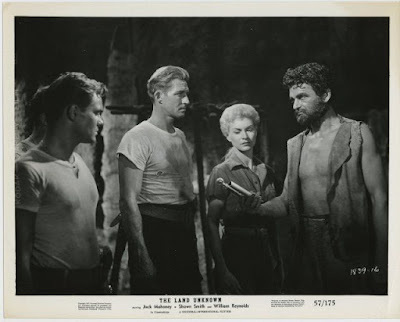 Jock Mahoney as Commander Harold Roberts, is your typical square-jawed hero. Shirley Patterson as lady reporter Maggie serves pretty much as eye candy and plays the usual fainting damsel-in-distress who needs frequent rescuing from those who wish to possess her. Mechanic Steve is a more realistic character combining essential elements of humanity with human flaws we are all subject to. The main stand-out character would be Dr. Carl Hunter played by Henry Brandon. Brandon manages to adequately convey the impression that he's been stuck in the prehistoric unknown land alone for so many years. Rather than evolving, Hunter has devolved! 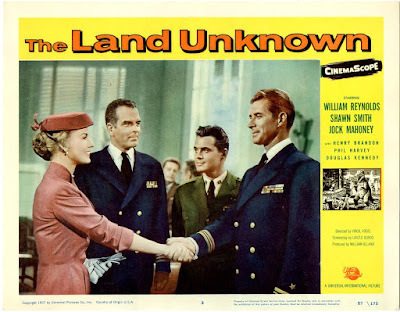 The Land Unknown does manage to cleverly incorporate the historical incident of the plane lost in the Byrd expedition of 1946. In the incident of the lost Antarctic plane in 1947, six men survived and were rescued 13 days later. Rear Admiral Richard E. Byrd, Jr., USN (Ret) organised a United States Navy operation called, Operation High jump, (The United States Navy Antarctic Developments Program, 1946–1947). Operation High jump commenced on 26 August 1946 and ended in late February 1947. Task Force 68 included 4,700 men, 13 ships, and 33 aircraft. Its primary mission was to establish the Antarctic research base Little America IV. Training personnel and testing equipment in extremely cold conditions. Maintaining and extending United States' sovereignty over the largest practicable area of the Antarctic continent. Determining the feasibility of establishing, maintaining, and utilizing bases in the Antarctic continent and investigating possible base sites. Developing techniques for establishing, maintaining, and utilizing air bases on ice. Adding to knowledge of electromagnetic, geological, geographic, hydrographic, and meteorological conditions in the region. The Byrd expedition has also managed to generate its share of fairy tale conspiracy theory stories. Stupidity and gullibility abhors a vacuum especially if that vacuum is the product of secrecy and misinformation. Questions have been raised concerning the haste with which a huge military so-called scientific expedition was mounted merely one year after the Second World War ended. Prior to the war, the Nazis supposedly explored a portion of the Antarctic coast, naming it New Swabia. They then were thought to have constructed underground bases where Nazi scientists commenced working on a flying saucer, the construction of which was allegedly based on a crashed UFO found in Bavaria in 1938. Sounds perfectly reasonable, right? Right? 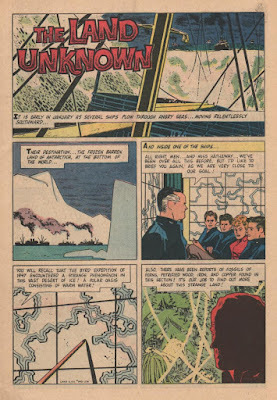 With the war going pear-shaped for Germany, Nazi scientists and other personnel were whisked away by U-boats to the secret bases in New Swabia to continue work on the Nazi flying saucer super weapon. Enter Admiral Byrd. His mission, it was claimed, was to locate the saucers along with the remaining Nazis. Somehow Byrd managed to meet with some aliens during a missing three-hour period of a flight. Shortly thereafter, the Byrd Expedition was called off prematurely, without much explanation. A story written for a child? This leads me to the question of why I decided to present the plot of the film, The Land Unknown in a format similar to that of a children’s story (with a lot of cheek and tongue in cheek). It struck me just how much of life we experience occurs at the level of a children’s story especially when it is stripped of its complexities and frequent dire consequences for individuals, communities and humanity itself. Take for instance, our interpersonal relationships; conflicts; wars; arguments; disputes; concerns; worries; stresses; preoccupations; economic, social and political arrangements; work place politics; social and other media representations of and commentaries on reality and so on. Who if anyone will truly live happily ever after?